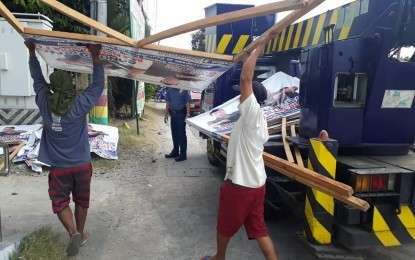 DAGUPAN CITY -- The Commission on Elections (Comelec) in Pangasinan, together with other national government agencies, removed oversized and misplaced campaign posters and leaflets of national candidates on the main thoroughfares of the province Tuesday morning. The activity headed by the Comelec called ‘Oplan Baklas’ was participated in by agencies including the Department of Natural Resources (DENR), Department of Public Works and Highways, Bureau of Fire Protection, Philippine National Police, and non-government organizations like the Parish Pastoral Council for Responsible Voting, as well as the media. “We are not yet able to count the total number of illegal campaign posters that were removed, but it is a lot. Again, this is mandated by the law and not just Comelec’s prerogative,” provincial election supervisor lawyer Alipio Alonzo Castillo III said in an interview. Under the law, Castillo said the posters should not be bigger than 2 x 3 feet or 3 x 2 feet, and should be placed in private properties or the designated common poster area. Local candidates’ posters which were placed in trees and government facilities were also removed, he said. “Although the campaign posters of local candidates are not yet subject to this ‘Oplan Baklas,’ those that are nailed or placed on a tree will be removed as well as per the order of the DENR. We will also remove those that are violating an ordinance in their respective towns or cities,” Castillo said. Despite the notice to voluntarily remove illegal campaign posters given by the Comelec to the candidates, there were still a lot that were taken down by the authorities. Castillo said the next ‘Oplan Baklas’ will already include the local candidates’ illegal campaign ads. 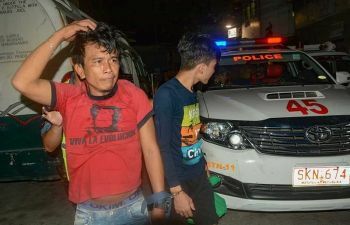 “The next clearing operation against illegal campaign ads will be set after the start of the campaign period for local candidates on March 29,” he added. Castillo is urging the candidates or their supporters to voluntarily remove the illegal campaign posters prior to their clean-up drive. Meanwhile, some 1,300 election technicians underwent training on Tuesday, February 26, in preparation for the upcoming midterm polls this May 13.